What place should God’s will have in our lives? That’s a question I know I’ve asked and (let’s be real, here) am continually asking. We wonder all sorts of things about God’s will. Am I understanding His will correctly? Can I step outside of God’s will? How do I best know what God’s will actually is for my life and what is just my will? Honestly, I don’t know how to perfectly answer any of those. One thing I have noticed though: talk. Sometimes, we’re too lazy to simply talk about God’s will. Other times, though, we talk about it. A lot. Don’t get me wrong. Seeking God’s heart and wanting to honor Him with our lives is more than important: it’s vital. But theorizing and delaying and hesitating and second-guessing and doubting and questioning and continually analyzing and constantly searching aren’t a healthy approach to God’s will. Waiting on God’s will is not an excuse for selfish living. What’s most important? Loving God and loving people (Mark 12:30-31). 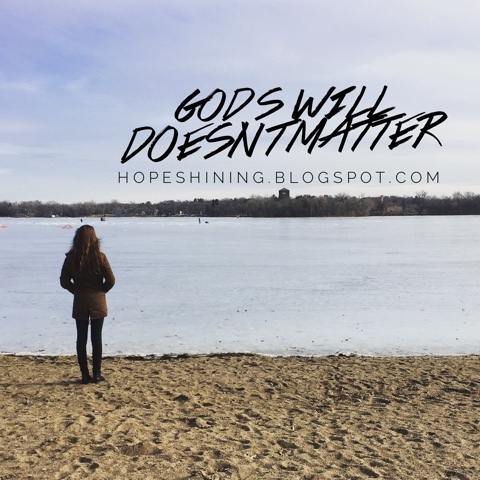 What’s solidly in God’s will, regardless of the circumstances? Rejoice. Pray. Give thanks. “…for this is God’s will for you in Christ Jesus” (1 Thessalonians 5:16-18). Let us stop this hyper-analysis. Rejoice that God is good. Pray that we will act according to His heart. Thank Him for the opportunities in our lives. Commit ourselves to Him and go. Go in faith that He will redirect but realizing that He cannot redirect something that never moves in the first place.